When you saw the title of this post I bet you thought I was writing to brag about our NL West Champion Giants – or even the brand new American League Eastern Division Champion Orioles. Both teams wear orange and black and both teams figure strongly into the Paladini family heritage. No. This is a different Orange Show. 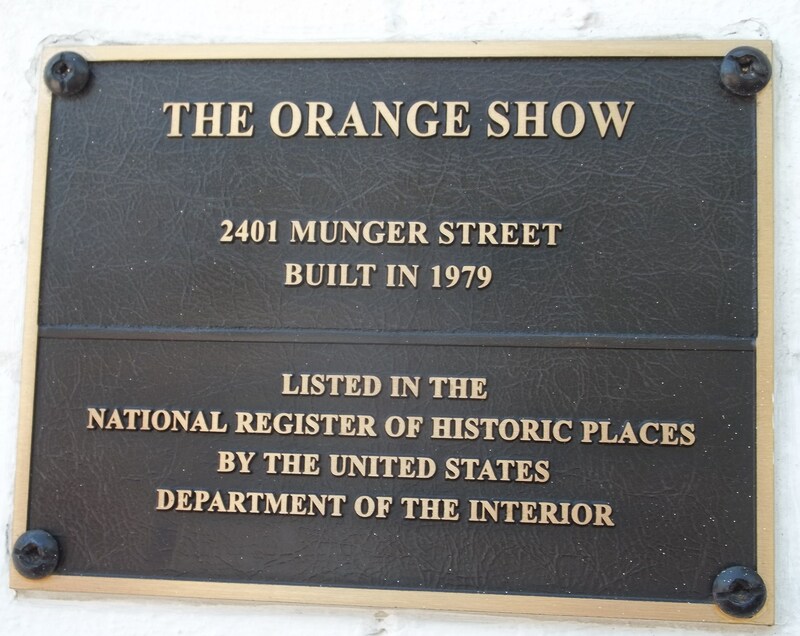 We visited my sister, Monica, in Texas this summer, and she and her husband took us to Houston’s Orange Show. With her tongue firmly in her cheek, Monica told us it was someplace she had always wanted to go. On YouTube we had seen an old film of the builder explaining his Orange Show project, and that was enough for John and Mick. The Orange Show is hard to explain. 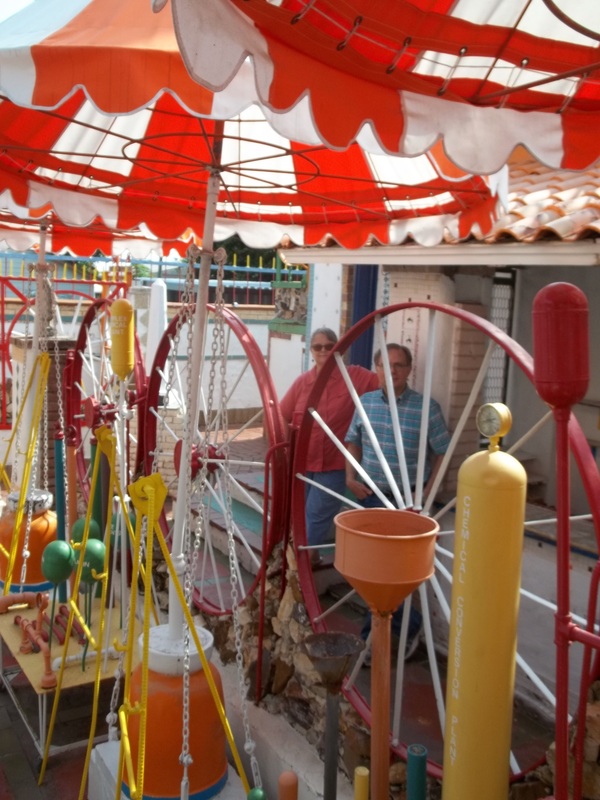 It’s a garish display of concrete, and tons of brightly painted scrap metal welded together. 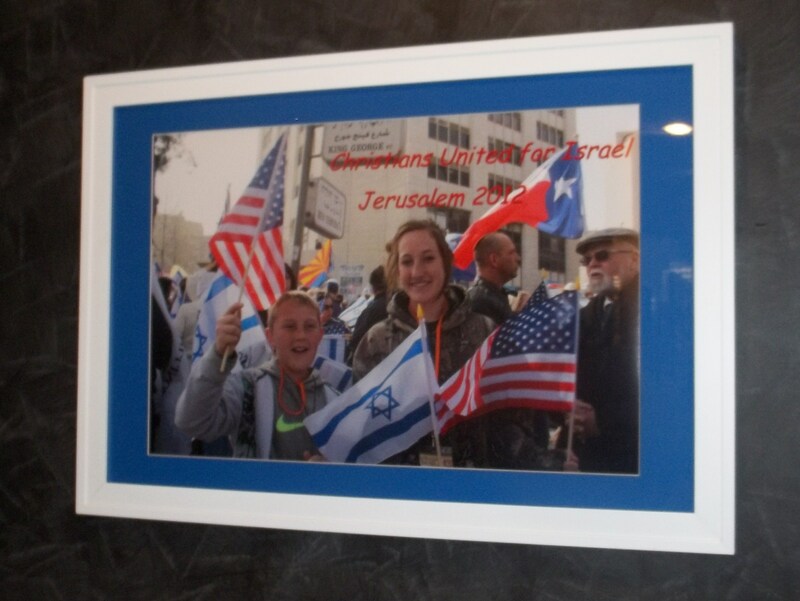 There’s a lot of tile work décor – borders, signs, and slogans. (And we noticed that spelling was not his strong suit.) McKissack was a busy man. His Orange Show covers at least two lots in the quiet neighborhood where he lived. 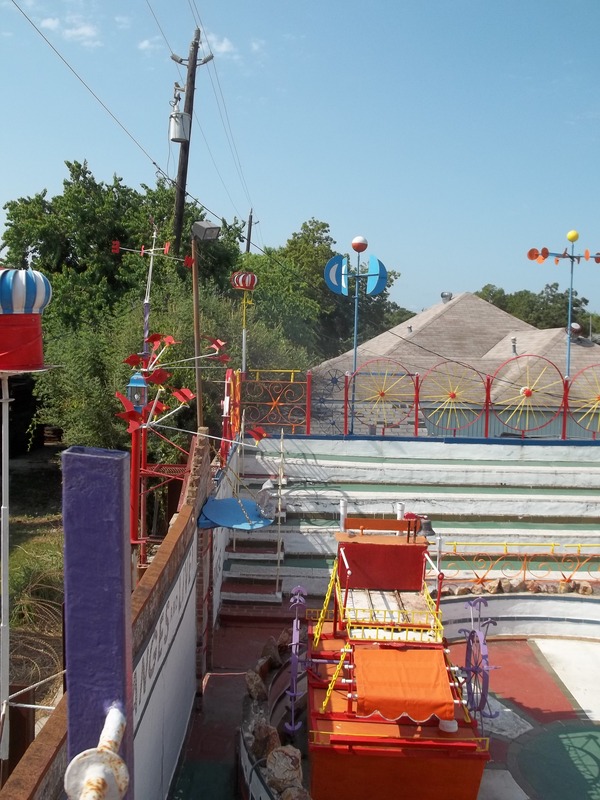 It has multiple levels with decks, balconies and catwalks which are reached by a variety of metal stairways. I wonder what the neighbors thought. When we arrived the place was pretty much deserted and we weren’t sure what to do. But moments later a lady, apparently the caretaker, walked out of the house across the street and took our admission – a dollar each. She invited us to go on in and explore and have fun. Then she went back into her house and we were on our own to wander and wonder. 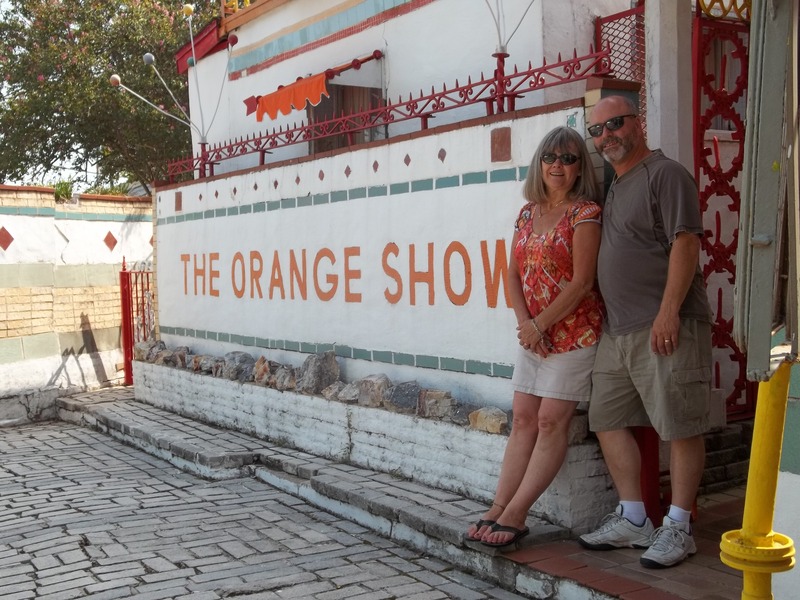 The Orange Show didn’t live up to Jeff McKissack’s expectations, but every part of it reflects his enthusiasm and optimism. We did not get the impression that he was disappointed in his life’s work. 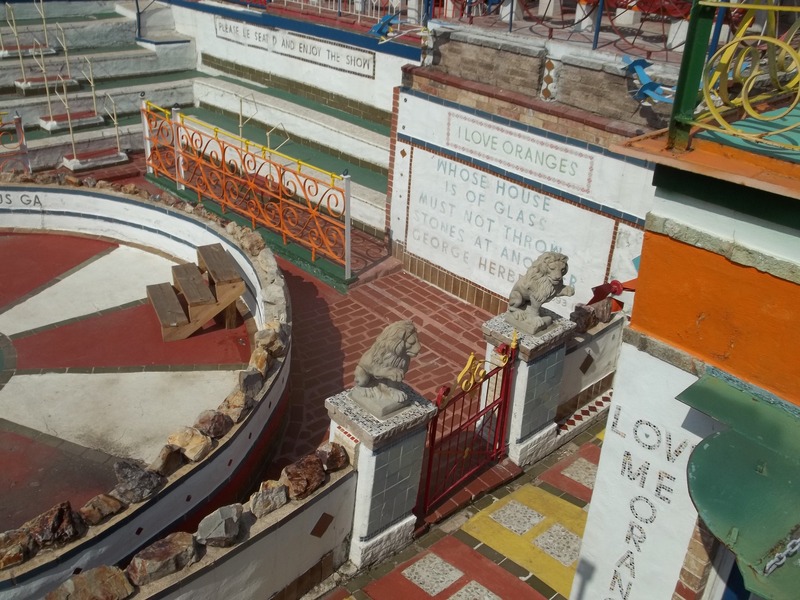 Since 1980, when Jeff McKissack died, The Orange Show has evolved into a non-profit organization called Orange Show Center for Visionary Art. Art patrons in Houston keep foundation alive, and provide programming for children and adults that includes music, storytelling and hands-on workshops. Jeff McKissack would be proud. 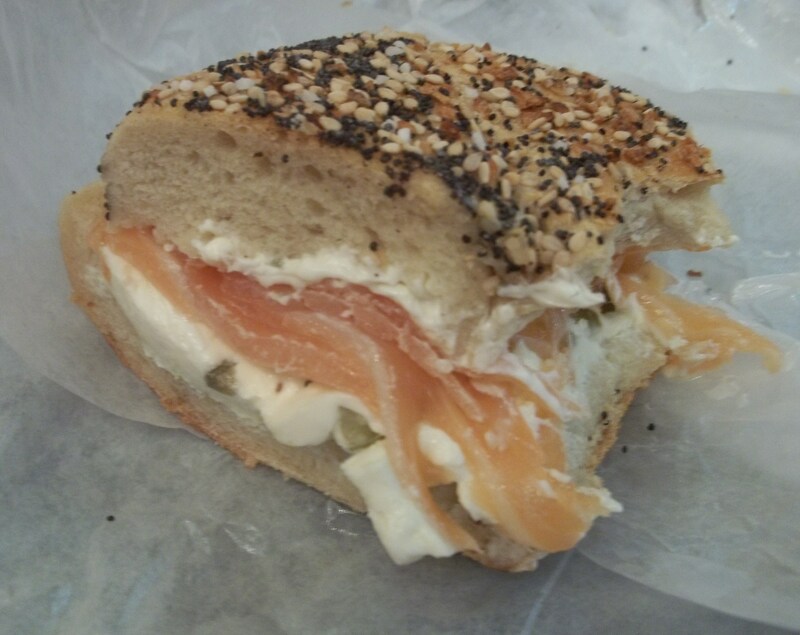 We recently spent a couple of days on vacation in New York City. It’s fascinating to walk the streets and avenues. You see an eclectic mix of buildings and architecture. 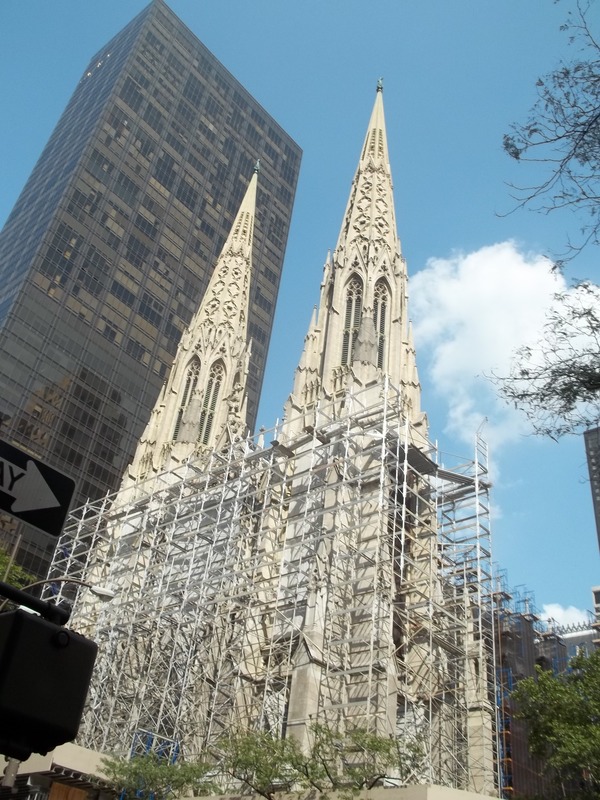 After our breakfast of an “everything” bagel with cream cheese (Andee had lox on hers) we headed up 50th Street to Madison Avenue, where Saint Patrick’s Cathedral has stood since 1879. 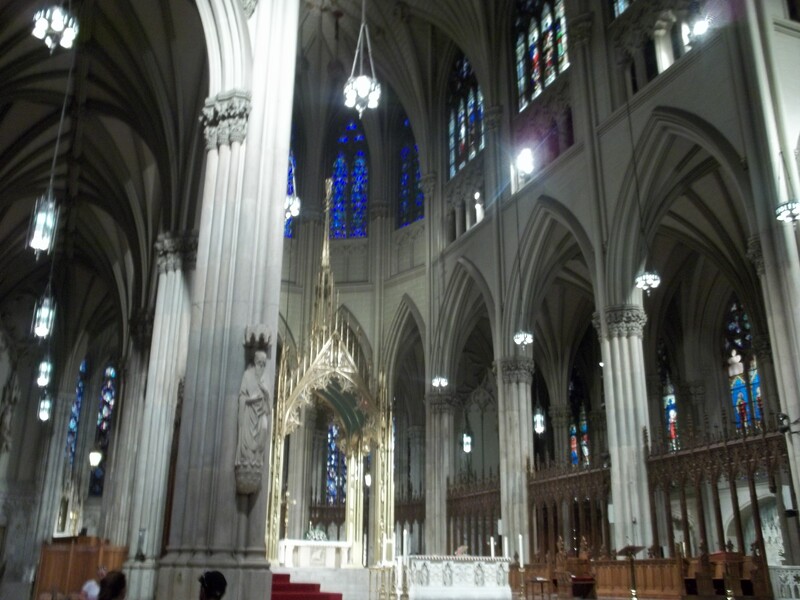 Its gothic revival architecture provides a sharp contrast to the modern buildings all around. 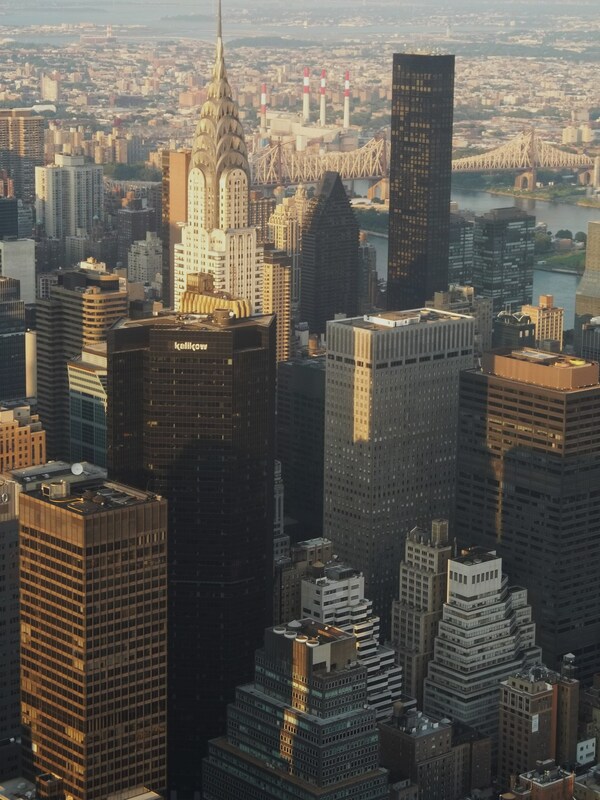 One of New York’s taller buildings in its day, the 328 foot spire is dwarfed by the many skyscrapers that sketch the New York skyline today. I hardly knew we had arrived as we wove our way, along the sidewalk, through a maze of scaffolding which envelopes the entire structure. I guess the recent 5.8 magnitude east coast earthquake has rattled authorities to require retrofitting these venerable edifices. Finally we escaped inside through the massive arched entry. We were transported back a hundred and thirty years in time. We marveled at the lattices and doors carved by skilled hands that long ago ceased their work. Marble floors trod by generations of souls seeking God. Volumes of quiet space as the arched ceilings draw your eyes toward heaven. Then as if on cue, the ancient pipe organ came to life and began to breathe its deep resonant tones until every nook and cranny was filled with worship. I hadn’t even noticed the worshippers in the pews until they began to sing praises to the Lord. I don’t know why it surprised me that the church was being used for the purpose it was created. The bible says though our outward man is perishing, our inward man is being renewed day by day. (2 Cor 4:16). I woke today with some aches and pains and realized I’m a lot like the cathedral. I continually need repairs. So if I notice a little scaffolding around my life, I’ll know that God’s at work and I still have days ahead to do what I was created to do. Worship him. 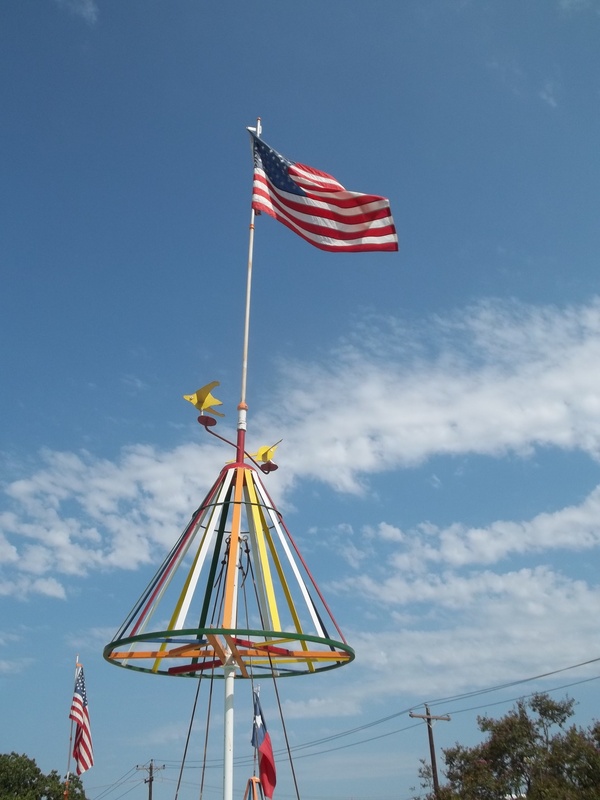 Categories: Guest Bloggers, Travelogue | Permalink. The year was 1859 and gold was not as plentiful as reports had indicated. All the easy placer gold on the western slope of the sierra was long gone, picked clean by the 49ers. The California gold rush was still luring prospectors with the possibility of hitting the mother lode and striking it rich. 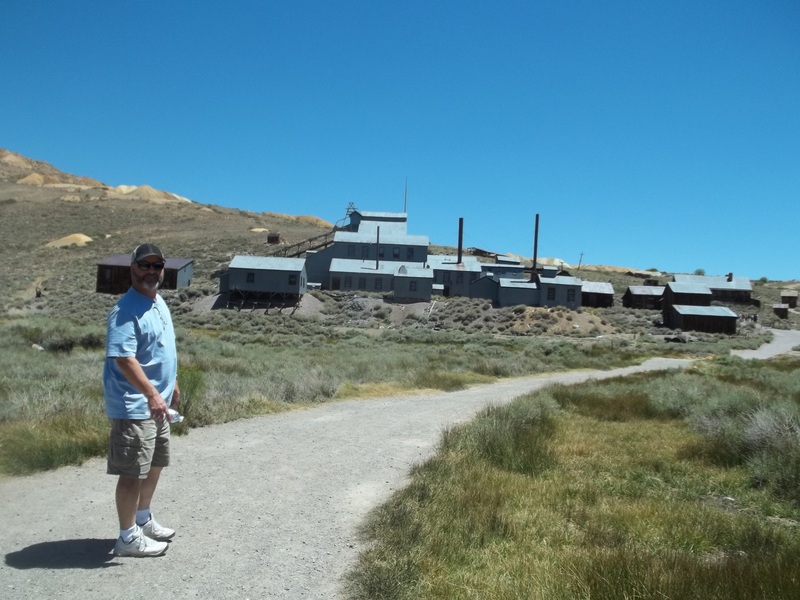 Then word came to the mining camps that gold was struck in Bodie! 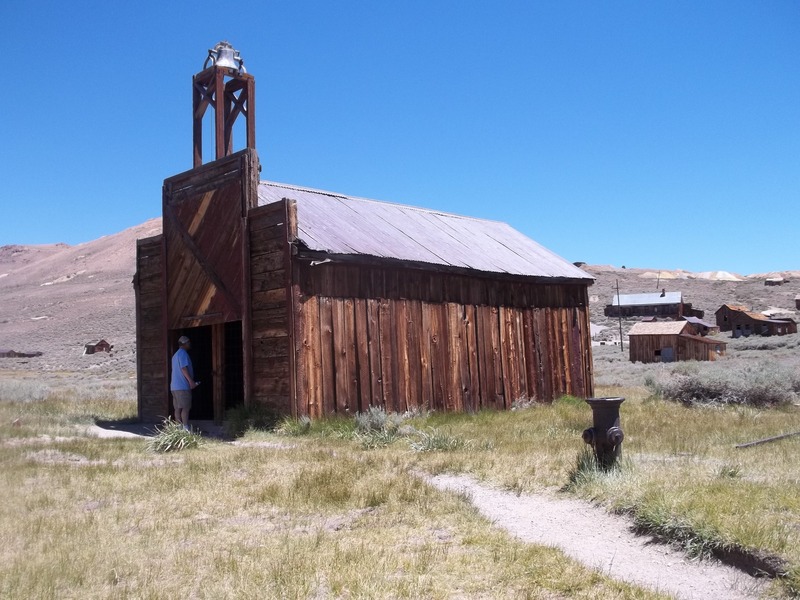 People of every sort packed up, lock, stock and barrel and headed for the eastern slope of the Sierra, to the Comstock Lode to seek their fortune. 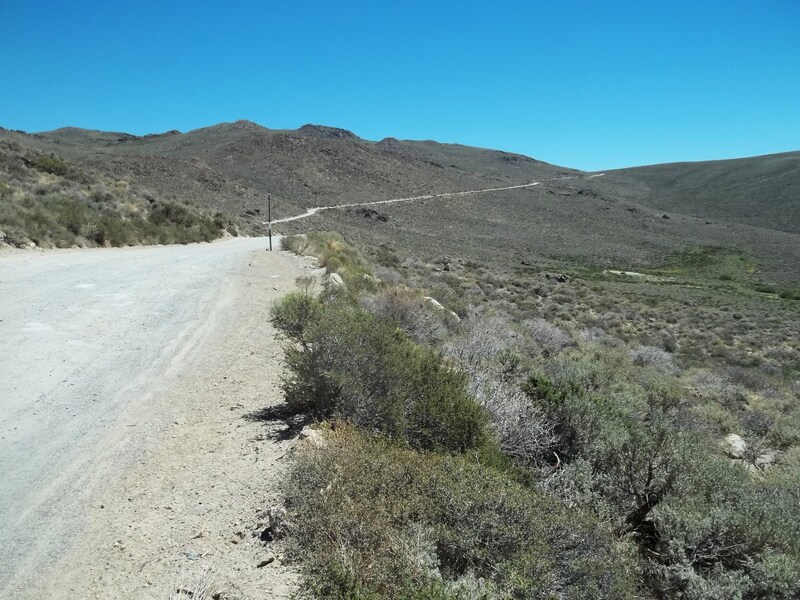 We must have passed the sign a dozen times over the years: Bodie 13 miles. 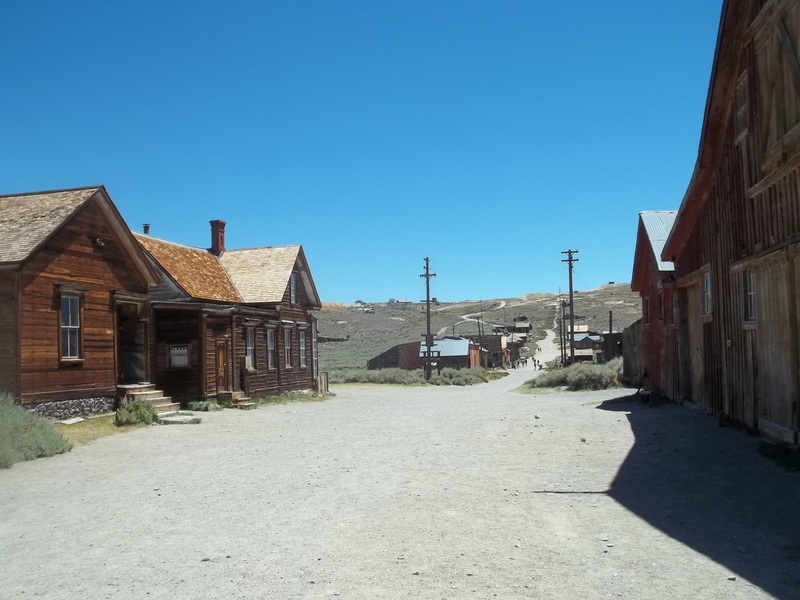 We always said, “We’ll have to go to Bodie one of these days.” Well, “one of these days” finally came and we visited Bodie. The first ten miles of paved road got us past the point of no return. We couldn’t change our minds now. Not after we’d come so far. So we drove our up-to-this-point-clean Avalon over the washboard dirt road for the next three miles, dodging pot holes and small boulders. 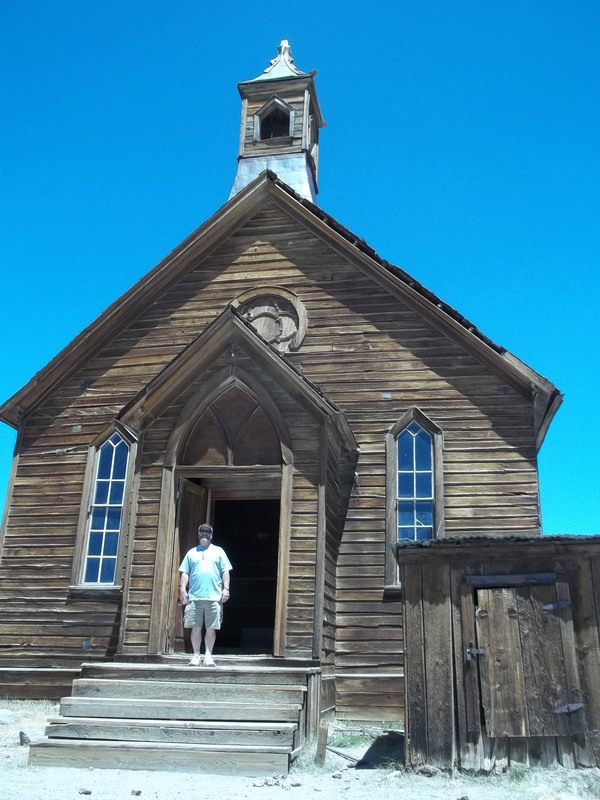 We were not disappointed when the ghost town of Bodie came into view. I was expecting a dozen or so remnants of a cowboy town. 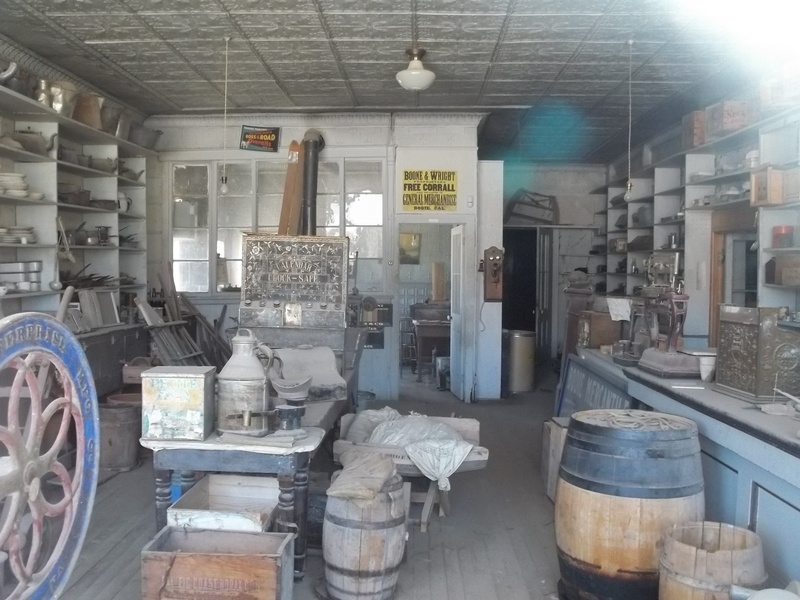 What we saw was a hundred or more buildings including an entire main street with several saloons, hotels, hardware stores, fire house, churches, a school and dozens and dozens of homes. Astonishingly, the buildings remaining are only 5% of what once stood on the site in 1880 when the population was 10,000 people. We took a walking tour through the town. I recommend the tour booklet (available for 2 bucks) which includes a map and a paragraph of history about many of the buildings. 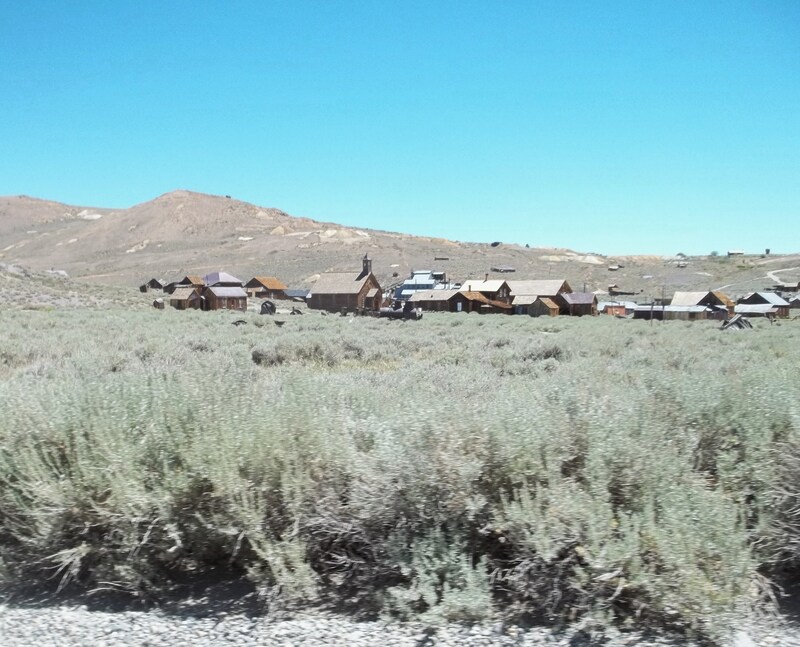 With the discovery of gold, the town of Bodie sprung up overnight. Gold was being extracted from hard rock mines where the gold is encased in quartz veins deep within the earth. To reach these veins, miners had to sink shafts deep into the ground and work thousands of feet below the surface. Miles of tunnel were dug underground and shored up with timber from the nearby mountains. Miners blasted and dug their way through the mountain, and descended in cage-like elevators, to fill buckets and ore cars with quartz rock. The work was dangerous. Cave-ins, explosions, toxic fumes, and flooding injured and killed many. The mine produced about a hundred million dollars in gold. Most folks brought by the lure of gold did not strike it rich, but became merchants, hotel keepers and civic leaders. 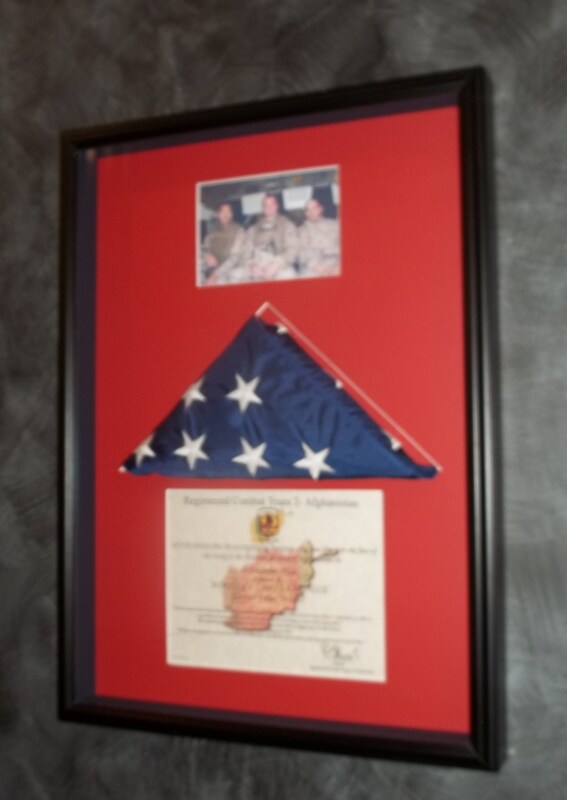 They earned their living providing a service in their community. 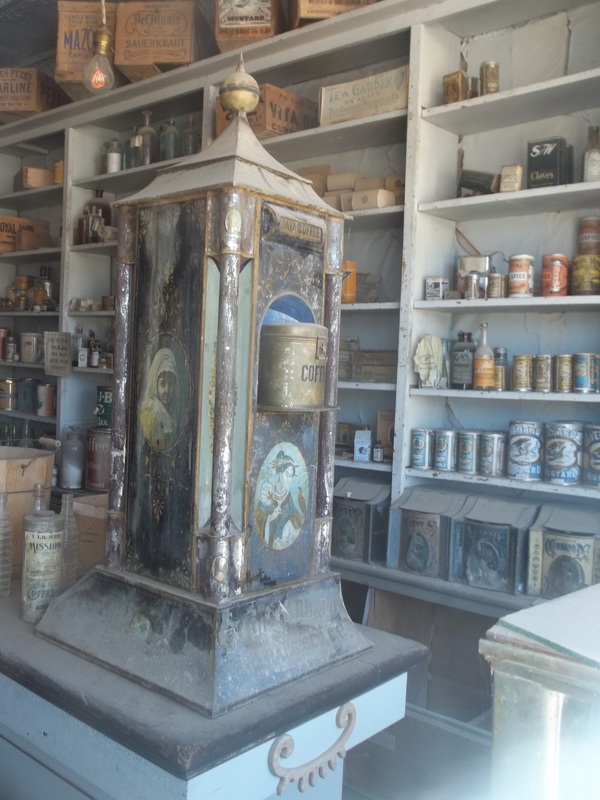 With the closing of the mines at the onset of World War II, the school and the post office were also soon closed and the last residents left town. The buildings remain in a state of “arrested decay” each with a rich history of the people who lived, worked and raised their families. And many of them are laid to rest in the Bodie cemetery. 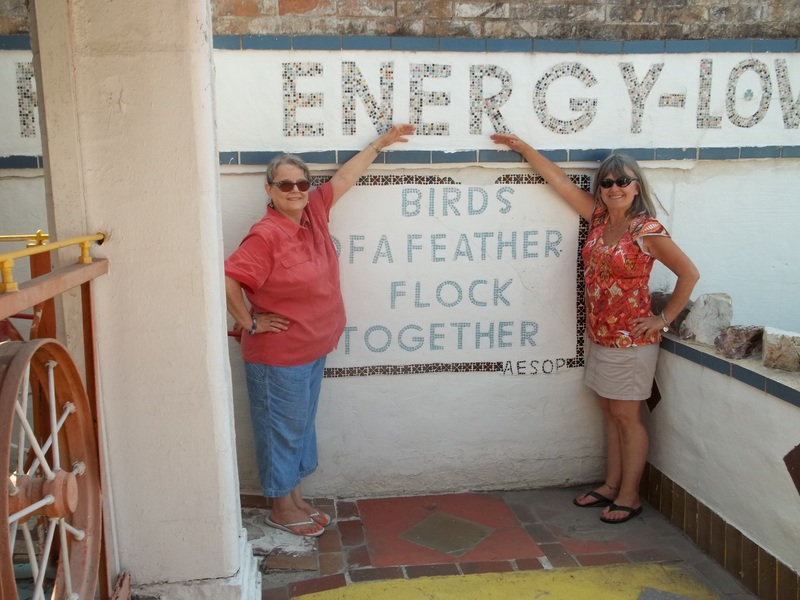 Driving to Fort Worth, we remembered the lunch we had packed – my sister, Monica’s, yummy southwestern quiche. But after our hilarious visit to Woody’s Smokehouse we were stuffed! Couldn’t even think about that quiche! “Well, we have have to stop in Corsicana even if we’re not hungry,” Patti insisted. “You have to see this little fruitcake bakery. 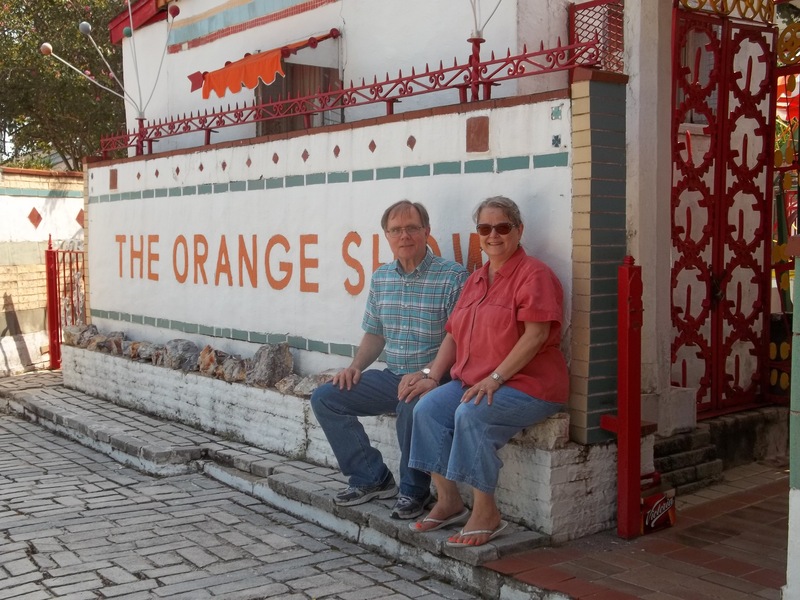 It’s been there since 1896.” She described a quaint, old fashioned place, with nice ladies who give you samples of fruitcake – fruitcake that will forever change your opinion of that much maligned dessert. “You will never think of fruitcake the same way,” Patti told us. After some confusion we found Collin Street Bakery in Corsicana, but it was not as my sister remembered it. Her face was a study in disappointment. I think she was ready to cry. 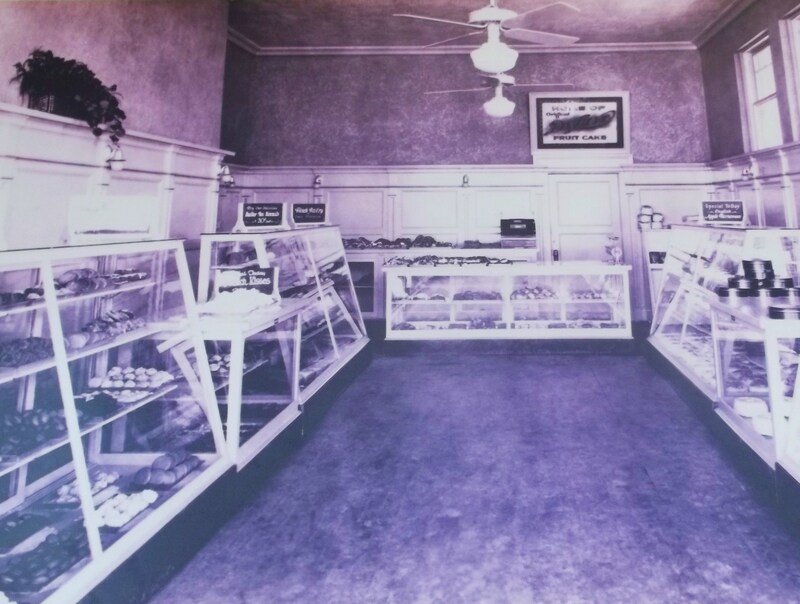 The cute old fashioned bakery had expanded to become a bright, pretty restaurant with chic little tables, and gleaming shelves with a variety of baked goods. 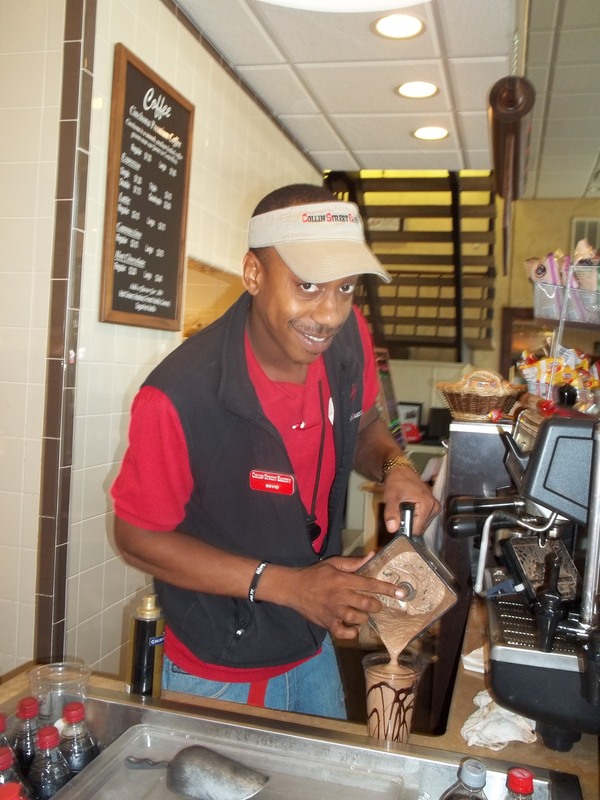 There was even a young man behind the counter making specialty coffees and frappes. Frappes for goodness sake! Sadly we walked out the door, and headed toward the car. “I can give you samples,” he insisted, holding out his hands. 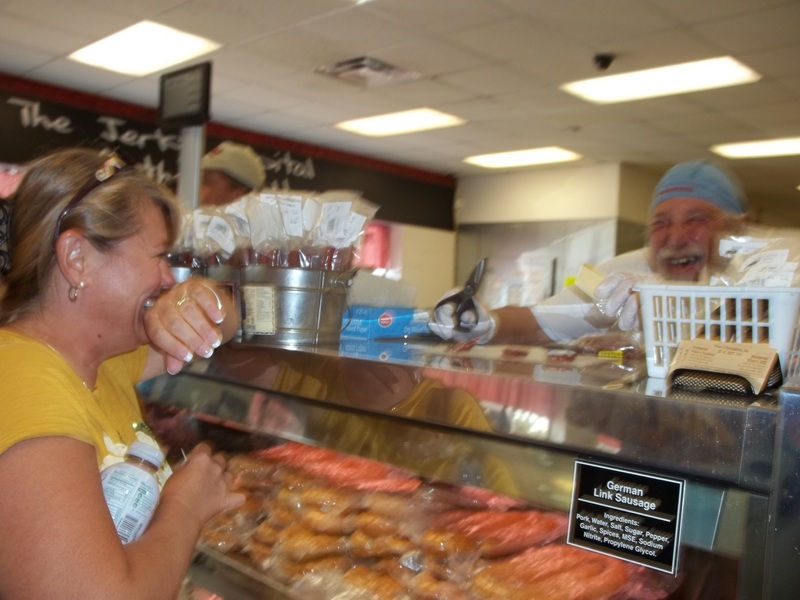 Holding our cookies and laughing, we followed George back into the store. “Here we go again,” Patti whispered. It seemed that we were eating our way across the state of Texas. And we did. The only problem was keeping track of which was which; and which we would want to buy. Fruitcakes are not being baked right now in the hot summer months, but production will begin in October and continue through January. 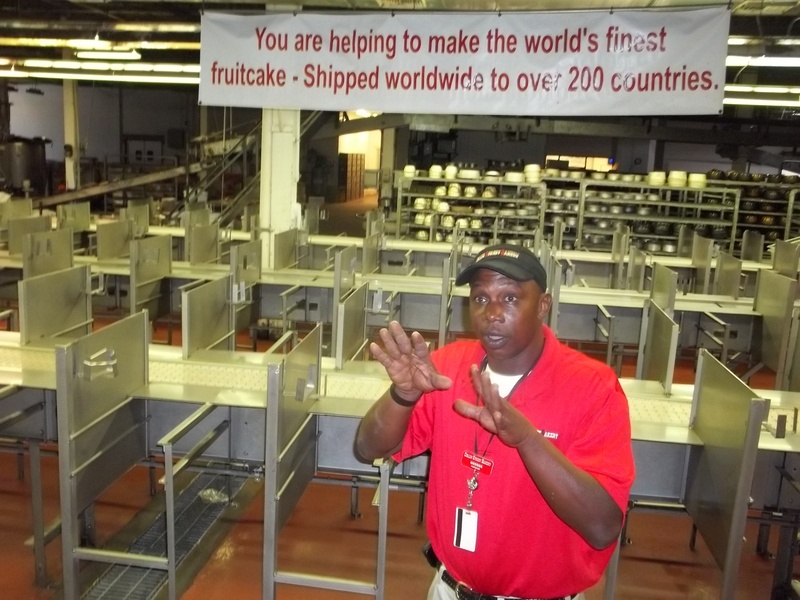 Thousands of fruitcakes that are shipped to more than 200 countries around the world. In the restaurant we had seen an enlarged picture of a postcard they received in 1979 from a customer in Norway. It was addressed to “Fruitcake Texas”. 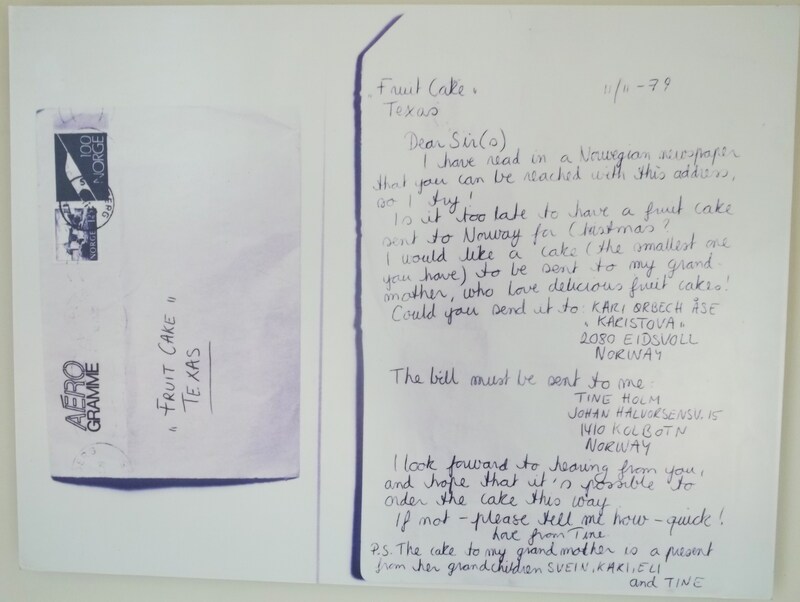 Apparently, even with that minimal address, the card had reached Collin Street Bakery and the Norwegian lady was able to get the fruitcake she wanted for her grandmother in Eidsvoll. 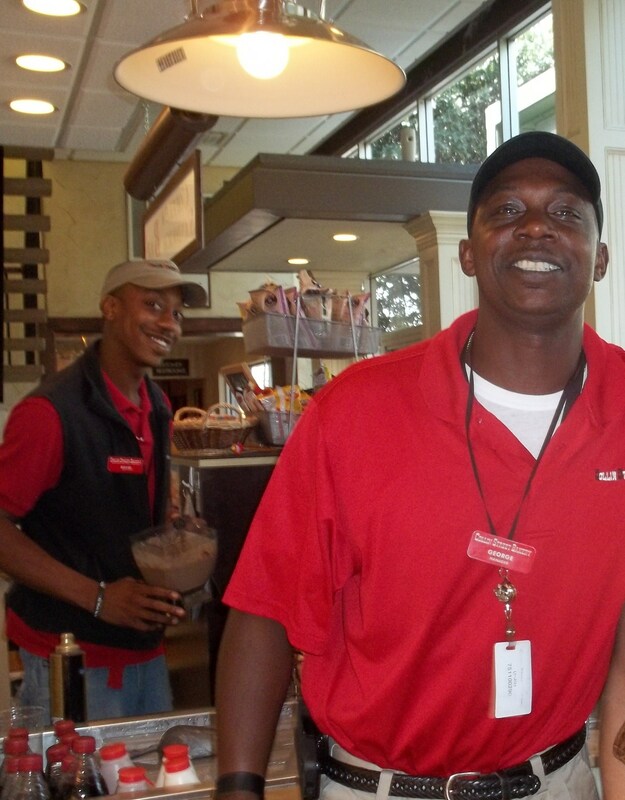 George told us that Queen Elizabeth II is one of their best customers. She purchases one thousand of their deluxe fruitcakes every Christmas. Princess Grace of Monaco was a good customer, and now her daughter, Caroline is carrying on the tradition. 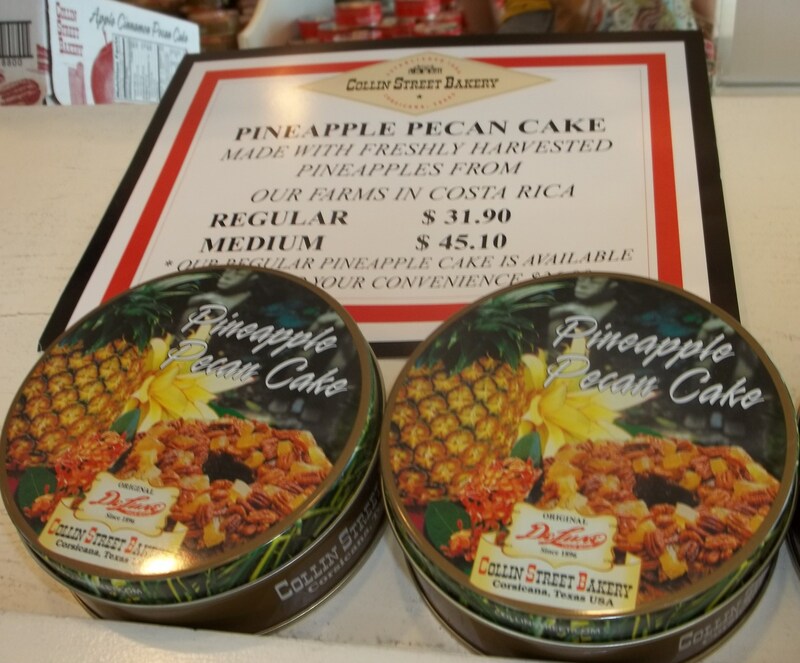 Collin Street Bakery also provides fruitcake for Madison Square Gardens, the Hilton Hotel Chain, and many others. 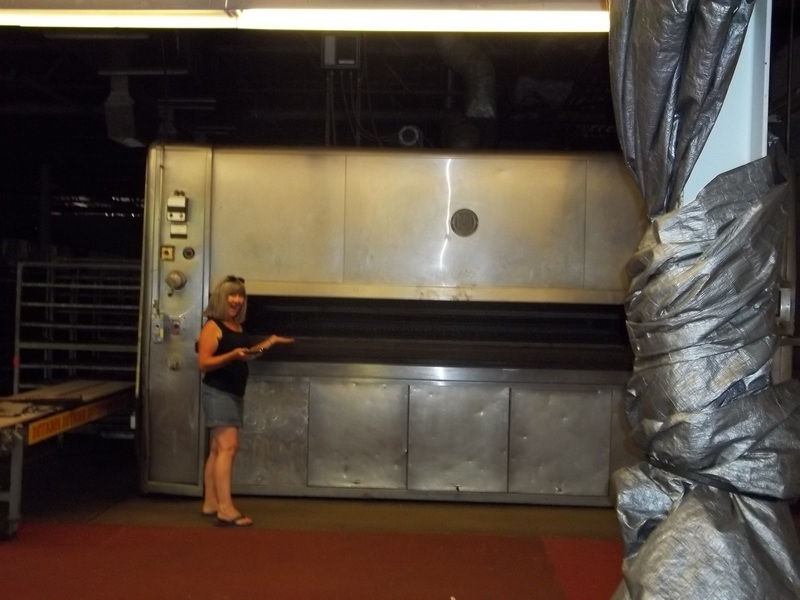 With so many thousands of fruitcakes flying across the country and around the world they need to have a big oven, and George was proud to point it out to us – an oven that can bake over 4,000 fruitcakes at a time. 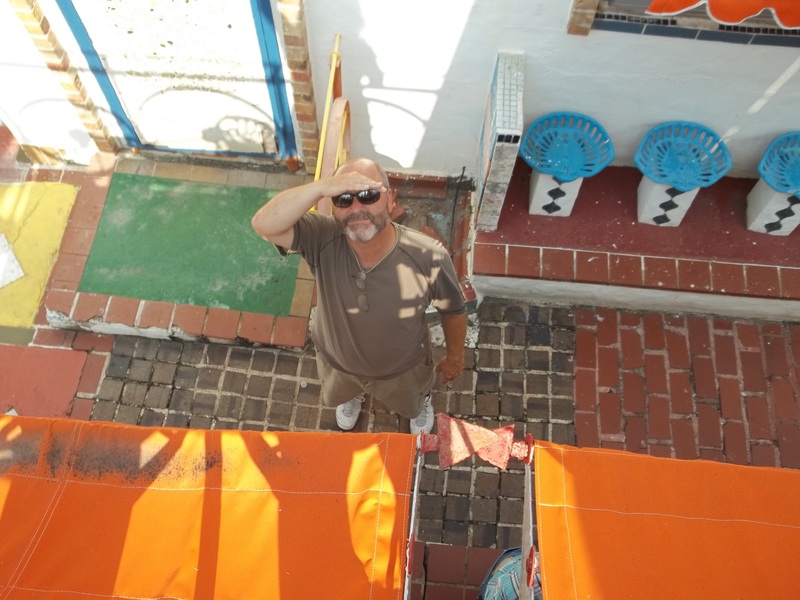 We said goodbye to George and his friendly staff, and thanked them for their hospitality. 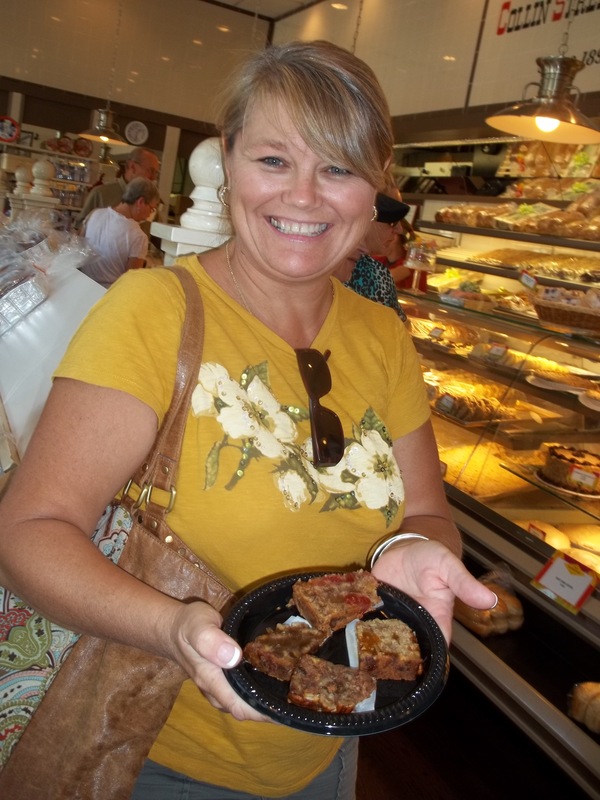 We promised to look them up on Facebook, and to tell all of our friends that you haven’t really tasted fruitcake until you have had one from Collin Street Bakery. Categories: Endorsements, Travelogue | Permalink. 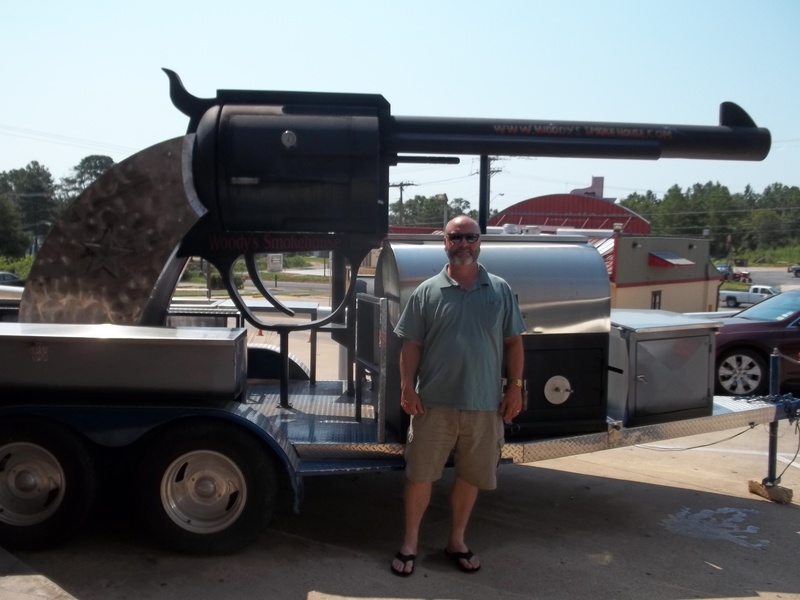 We knew we were in Texas when we saw the gun-shaped smoker outside the store. Yep, nothing less than a smoking gun. Smoke comes out of the barrel as your brisket cooks to a rich, smoky tenderness. John and I were with my sister, Patti, driving north toward Fort Worth. We had decided to look for a place to stop and get a soda, and we got a lot more than we bargained for! The first thing we saw when we walked in the door was a long cold case with at least a hundred different kinds of jerky, smoked meats and cheeses. Captain Too High of the Gypsy Motorcycle Club was manning the counter. When he saw me taking a picture of him the action began. “First time here?” he barked. I don’t remember exactly what we solemnly vowed. We were laughing too hard. 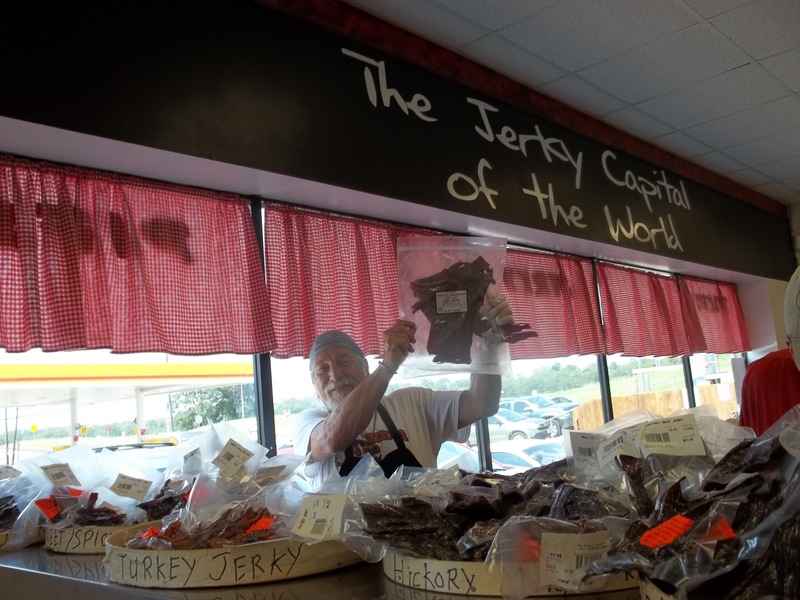 But it had something to do with telling the world about the best jerky we ever tasted, and that it is to be found here at Woody’s Smokehouse, the self proclaimed Jerky Capital of the World. Captain Too High handed us each a generous sample of moist tender beef jerky. “Now stay right there,” he warned, hurrying off to a back room. Captain Too High returned carrying a huge tray with samples of smoked brisket, buffalo jerky, elk jerky, turkey jerky and who knows what else? It’s a blur in my memory. We tasted them all. 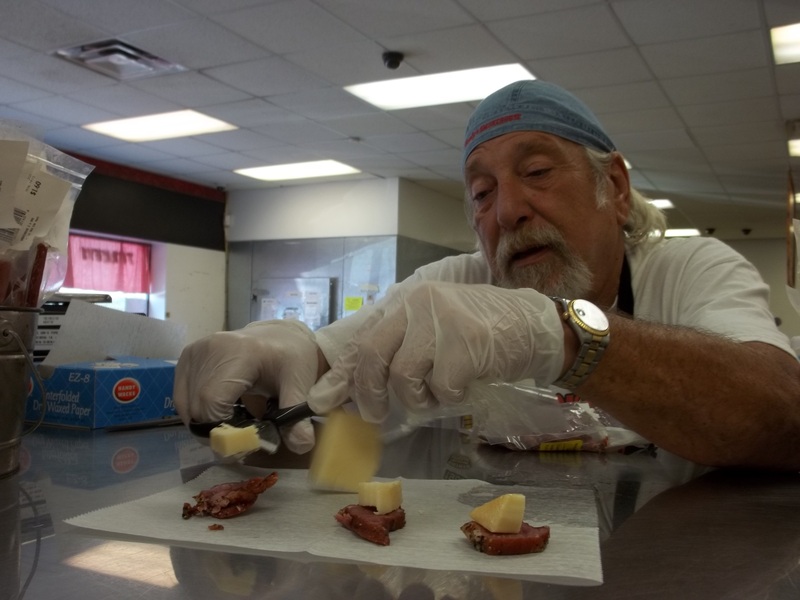 Then he gave us samples of smoked swiss cheese and smoked quail breast wrapped in bacon. Captain Too High urged us to go look at the Wall of Fame at the back of the store. 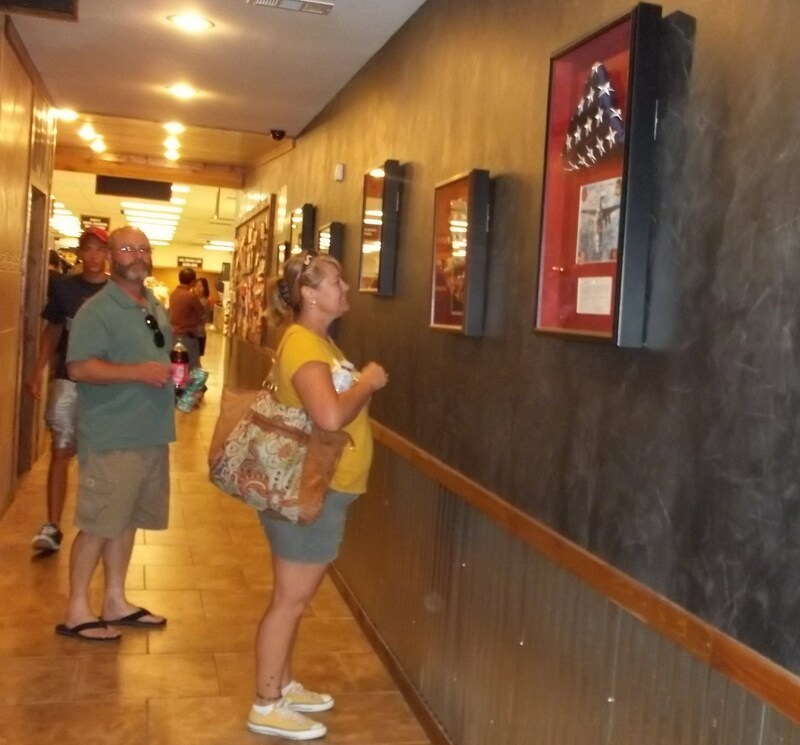 It was a long hallway lined with letters of appreciation, photos of American servicemen and their families, and United States flags that have flown over various military camps and forts. We found out that this patriotic company sends 4000 packages of jerky to our troops twice a year. We left Woody’s with the soda we stopped for. We also had packages of jerky to take home as gifts. 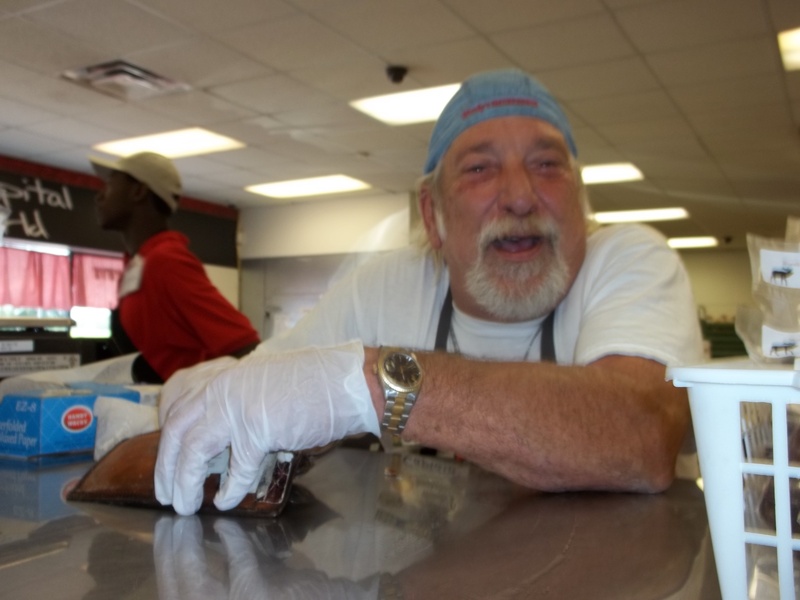 As we continued north toward Fort Worth we were stuffed with good meat and goodwill. We couldn’t stop laughing and talking about Captain Too High’s stories and shenanigans, and we just felt proud to be Americans. You can check out Woody’s Facebook page right here! How do you float a barge over a mountain range? That was the challenge in upstate New York in 1817. Navigating a boat over Appalachian Mountains sparked the spirit of American ingenuity, and the Erie Canal was conceived. A waterway from Lake Erie to the Hudson River that would lift a barge 500 feet would provide a way to deliver goods and produce from rural inland farms to the growing metropolitan cities. Immigrants from Ireland, England and Germany flocked to America, the land of opportunity, to work on the project. They carved the 363-mile-long, and 40-foot-wide canal using picks, shovels and horse carts as it was before the days of motorized equipment. 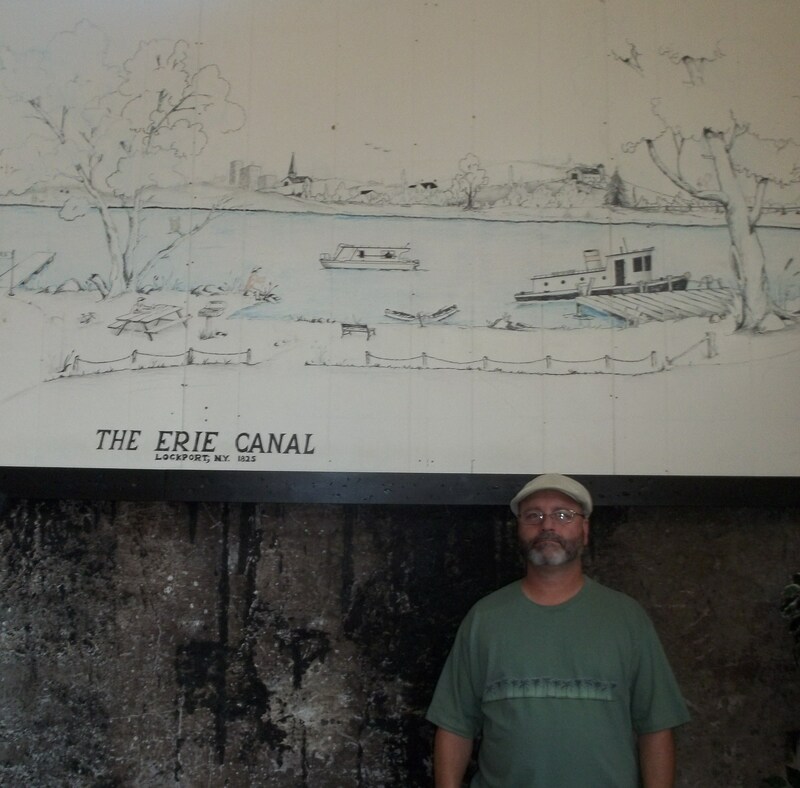 We recently took a ride on the Erie Canal out of a little town called Lockport, New York. We learned that the canal has a total of 85 locks. A lock is a chamber the boat enters and is locked in by water gates. The lock is then filled with river water, diverted from upstream, until the boat is raised 25 feet. 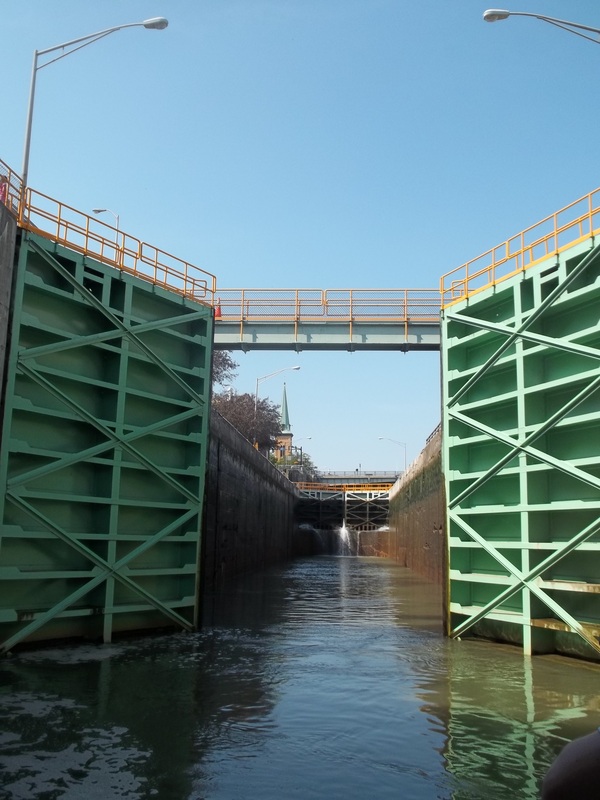 Once the water level in the lock is equal to the water level of the river, the gates part and are opened. It is amazing that no pumps or any kind of machinery are needed to raise the boat. The simple physics of gravity and buoyancy do all the work. Even the weight of the water pressure holds the gates closed until the pressure on each side of the gate is equal. Then they can be easily opened and the boat or barge can continue on its way. 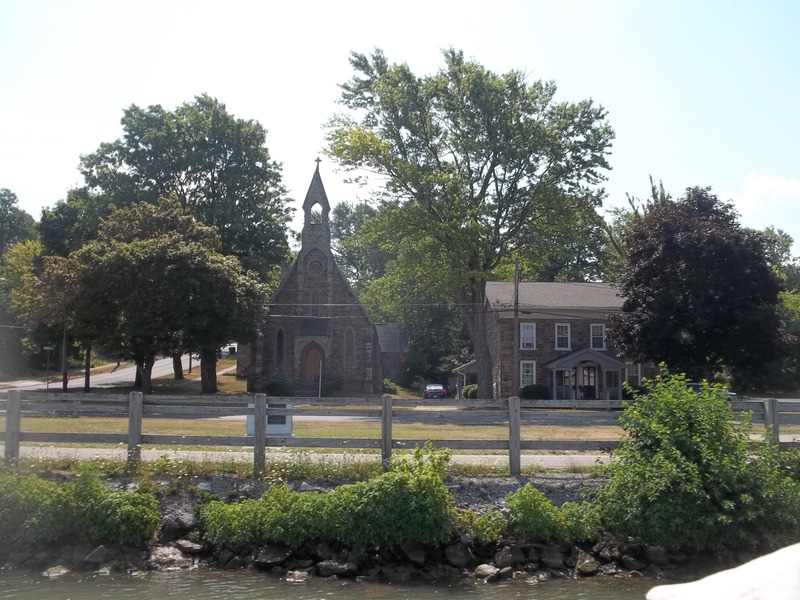 As you travel along the canal you can see many churches and homes built with “free stone” which is the material that was excavated during construction of the canal, free to anyone who wanted it. Barges were the most practical way to move heavy loads from one place to another. They were pulled along the canal by mules at a speed of about 2.3 miles per hour. They covered about 55 miles in a 24 hour period so the trip took about 6 1/2 days. Later the railroad came, and could haul freight at a speedy 30 miles per hour. 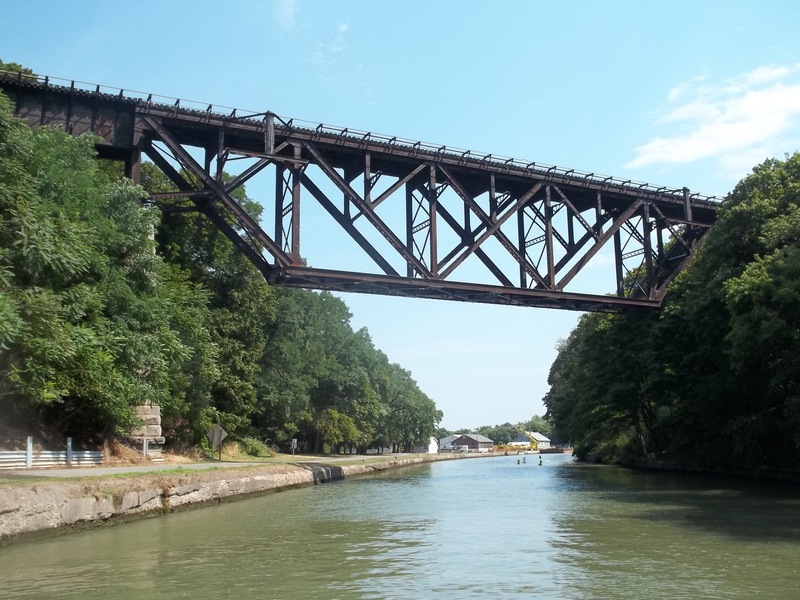 Competing for business, the railroad even built “up-side-down” railroad trestles over the canal to limit the height of the load a barge could carry. “Low bridge, everybody down” became a familiar call. Ultimately the canal system couldn’t compete and the railroad became the standard way of hauling freight. 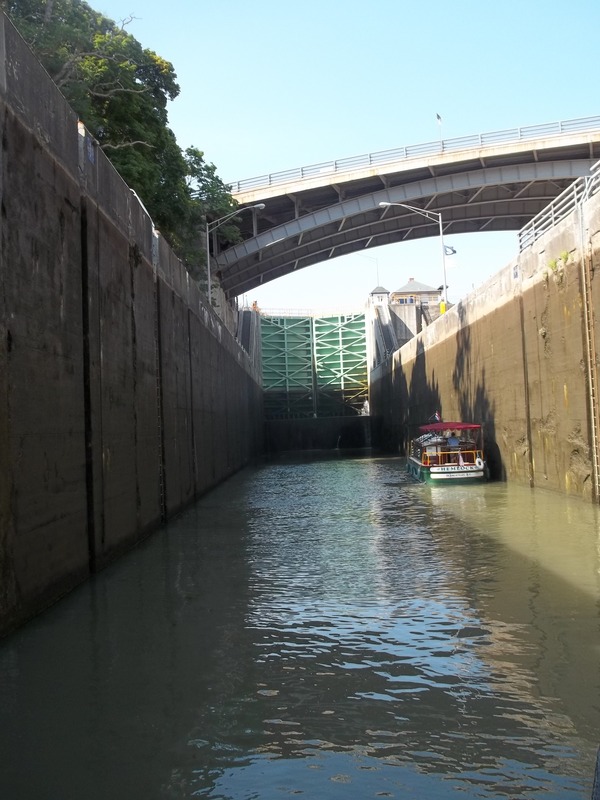 Today the Erie Canal is used mostly for recreation and pleasure cruising. 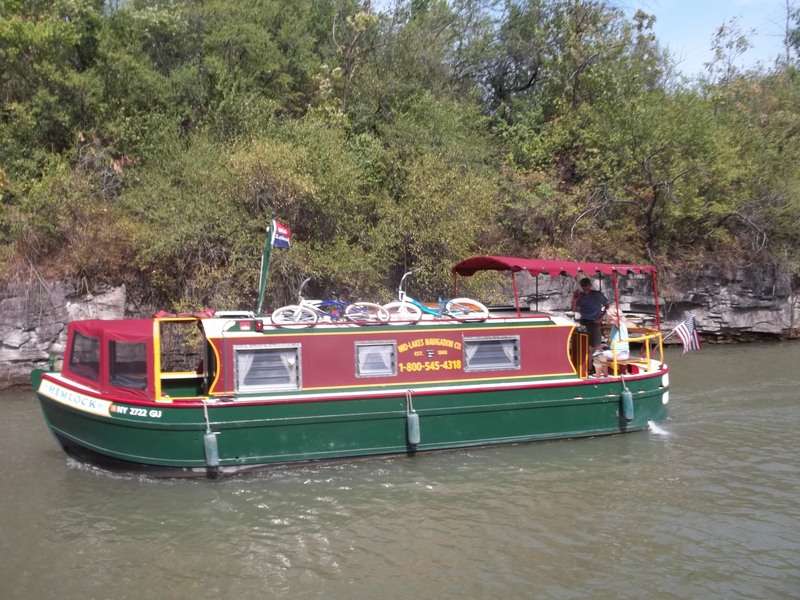 People rent houseboats that are replicas of the early canal boats, and cruise for their family vacation. But the canal was one of the key elements in the early commercial success of the United States and an important step in our nation’s expansion west.